I hope you think these are as cute as Dea does. 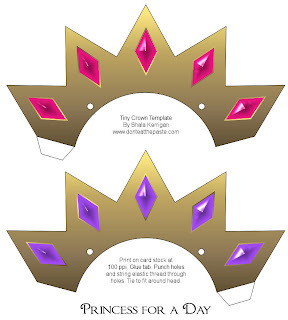 I'm working on a little felt crown for her to clip in her hair and decided it would make a cute printable party hat. 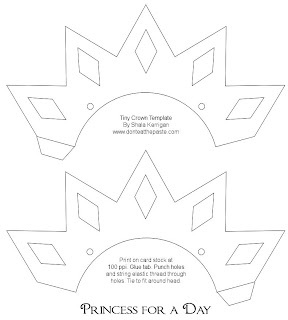 Print on cardstock, cut out, glue tab then use a hole punch to punch the holes and string elastic through and knot to wear headband style. Dea suggests a jaunty angle for a very cartoon-y look. I included a blank version to personalize or to print out for little or big princesses to color themselves.Click on the images for the full sized versions. I think they would look really pretty encrusted with glitter if you don't mind getting glitter in your hair! 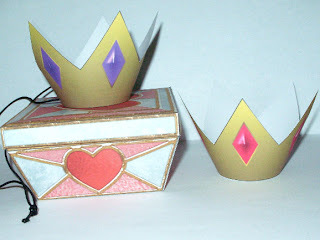 What a great craft for a princess party. Thanks so much, I'll be linking.